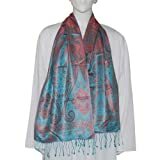 Mens scarf silk handmade by artisans from India. Neck scarf in pure silk with jacquard paisley design weaving lends charm and personality to men. It is meant to provide casual elegance. Neck scarf is a very special gift for him. 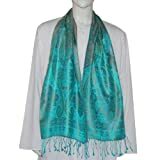 Product Description : Mens scarf silk handmade by artisans from India. Neck scarf in pure silk with jacquard paisley design weaving lends charm and personality to men. It is meant to provide casual elegance. Neck scarf is a very special gift for him. These handmade silk neck scarf mufflers are created by the hereditary weavers of Benaras. The tools used are very basic in nature- wooden blocks for marking designs on silk. Scarfs mens accessory handmade by artisans from India. Neck scarf in pure silk with jacquard paisley design weaving lends charm and personality to men. It is meant to provide casual elegance. Neck scarf is a very special gift for him. Product Description: Scarfs mens accessory handmade by artisans from India. Neck scarf in pure silk with jacquard paisley design weaving lends charm and personality to men. It is meant to provide casual elegance. Neck scarf is a very special gift for him. These handmade silk neck scarf mufflers are created by the hereditary weavers of Benaras. The tools used are very basic in nature- wooden blocks for marking designs on silk.